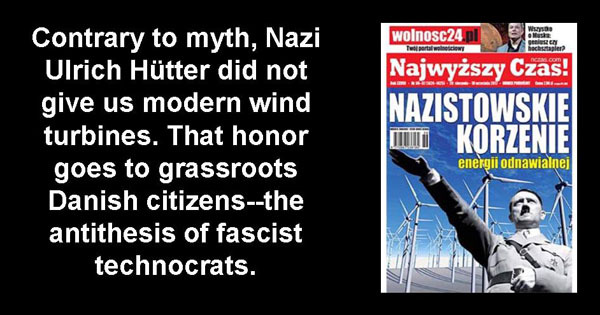 Rightwing Poles have raised the old canard that wind turbines and, hence, wind energy, is the detestable spoor of Nazi racial ideology. Nothing could be further from the truth. 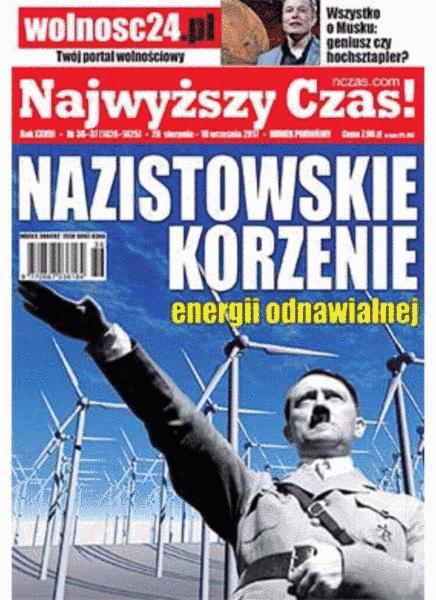 Craig Morris brought to my attention a recent front page of a Polish tabloid associating a phalanx of wind turbines with Adolf Hitler. As with any effective propaganda, there must be a kernel of truth that can be twisted to serve the propagandist’s objective. So it is with wind energy and the Third Reich. I first wrote about this subject in my 1995 book Wind Energy Comes of Age. I expanded on the theme with more up-to-date information in my current book Wind Energy for the Rest of Us. Contrary to popular myth, it was not Ulrich Hütter that gave us modern wind turbines. That honor goes to a Dane, Johannes Juul, and to Danes who drove the modern wind turbine revival. Hütter, an early Nazi Party member, worked for Ventimotor in Weimar developing wind turbines. Buchenwald, one of Nazi Germany’s notorious concentration camps, was just outside Weimar.
. . . “Instead, Hütter’s legacy is his aesthetic sense that wind turbines must be pleasing to the eye. It is also his insistence on wind turbines designed for low specific power that can be used in areas of low to moderate winds—where most of the world’s people live. It is also his contribution to making blades from composite materials and for a practical and durable method of attaching them to the rotor hub: the Hütter flange. As I say in a recent article (Buchenwald’s Liberation and What It Says about the Development of Wind Energy) and in my new book, the one contribution that Hütter did make to wind turbine technology was how the blades attach to the rotor’s hub. Ironically, it was Danish grassroots citizen activists—the antithesis of fascist technocrats—that adapted Hütter’s concept to make wind turbines work—for everyone. No, it wasn’t Nazi’s that developed wind energy. They tried and they failed. Rather than a tool for oppression and enslavement, wind energy was developed by Danish farmers and dreamers to liberate the people from the tyranny of fossil fuels and nuclear power. And they succeeded.